On its website (www.giradin.fr), the company GIRARDIN outlines its strengths: quality, reactivity and punctuality…among others! These qualities are source of pride for the Company from Grasse, and remain true for the 3rd generation. In 1954, Maurice, the grandfather created his business. Then, coal was king in French homes before being replaced by gas. And 10 years later was the arrival of the fuel on the market. In the sixties, Maurice decided to partner with the company Total France in his concern to satisfy his clientele with quality and safety. The first hand over happened in 1971, Jacques and his sister Nicole took the lead and develop the domestic fuel. The beginning of the 90’s marked the induction of Jacques’ sons. Mark became responsible of the lubricant sector when Fred was in charge of the fuel and domestic fuel. Luc, the last son of The Girardins joined the rest of the family in 1998. At the time, he did not know that he would specialize in bunkering. This branch was created in 2008 thanks to an unusual request from a boat moored in Cannes. “There was some urgency and we covered the delivery in time” remembers Luc. The innovative trio of entrepreneurs saw the opportunity in this good fortune. “It was a new market to take over” says Luc Girardin who was responsible to follow up on this new option. 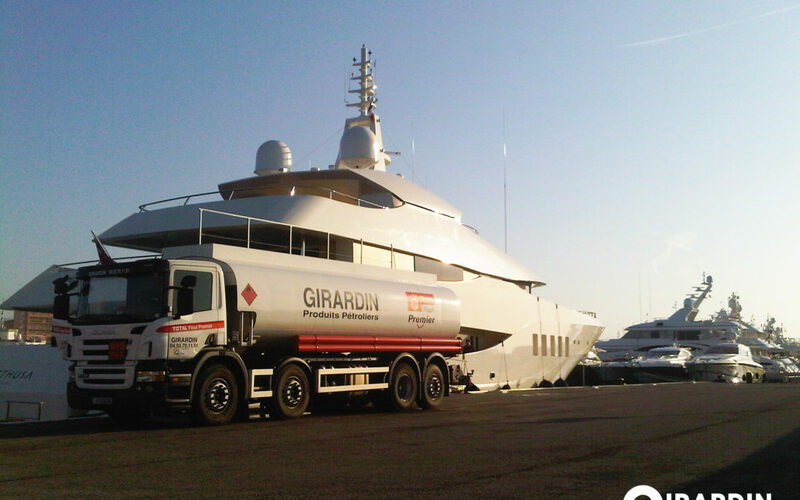 Today, the bunkering represents 40 % of the activity of the company GIRARDIN that works with brokers and harbour aster’s offices from Monaco to Saint Tropez. What will it be like tomorrow, with the cleaner energies and the drastic rise of the price of fuel? the energy mix, thanks to technological advances, ships consume less fuel, it’s a fact! I consider that the saved energy is the one that is not consumed and building all-electric yachts is impossible. However, hybrid engines could be the possible evolution for yachts.” says Luc Girardin. The bunkering companies are not the only ones concerned by this scenario. Ports of France generate direct and indirect employments like the port Camille Rayon. SAS GIRARDIN always managed to adapt to financial and environmental storms. This bodes well for the fourth generation.